Zimmerman pine moth (Dioryctria zimmermani) was first detected in the US in 1879, and has subsequently been found and is established throughout the northern US east of the Rocky Mountains. Austrian and Scots pines are preferred hosts of Zimmerman pine moth. However Eastern white and mugo pines are also attacked. Appearance: Adult Zimmerman pine moths are midsized with gray and red-brown wings, marked with zigzag lines. Larvae are generally dirty white to light grey and up to one inch long. They can only be found in pitch masses, under bark or in new shoots. Symptoms and Effects: Zimmerman pine moth larvae tunnel into new growth causing shoot dieback, or into whorl areas causing masses of pitch to form at the wound site. Repeated attacks by the larvae cause a weakening at the area of the infestation and make the branches and trunk susceptible to breakage. Life Cycle: Zimmerman pine moth has a one-year life cycle and spends the winter as a young caterpillar underneath bark scales of infested trees. In mid to late April, larvae become active and they migrate to the base of branches or shoots and burrow inside. Larvae continue to feed into July and then pupate within a chamber in a mass of pitch. Adult moths emerge from infested trees in late July and August, and lay eggs near wounds or preexisting masses of pitch. 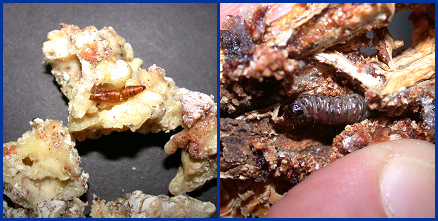 Eggs hatch in approximately one week and larvae feed for only a brief time before preparing to overwinter under bark scales. 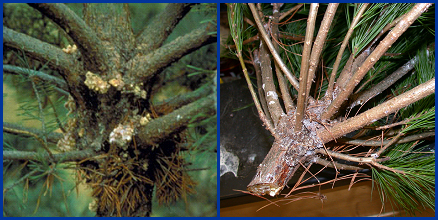 Zimmerman pine moth pupa (left) and larva (right) embedded in masses of pine pitch. Control: Avoid plant injury (e.g., construction injury) and environmental stresses (e.g., drought stress) that can make trees attractive to Zimmerman pine moth adults. Also, consider removing heavily infested trees before July to reduce the number of adults that will emerge in the vicinity of, and potentially infest, healthy trees. If opting to use insecticides to control Zimmerman pine moth, applications must be made in the spring, before larvae migrate into tree trunks. Preventive insecticide sprays should be applied as a drenching spray to trunks in mid to late April. Spraying branches and foliage is not necessary. Permethrin or bifenthrin are preventative sprays that are available for use by homeowners. Chlorpyrifos (sold as Dursban) can be used in nurseries and Christmas tree plantations. Sprays applied in early September to kill small larvae are not recommended as they tend to have only spotty success. For more information on Zimmerman pine moth: Contact your county Extension agent. Thanks to Diana Alfuth, Mark Kopecky and Ann Wied for reviewing this document.